The Modu Mini phone has now reached an official status of “the lightest mobile phone in the world”. It weighs a puny 1.4 ounces and measures just .3 inches thick. The record was recorded by the Guinness book of world records. 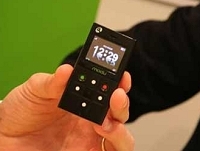 The Modu Mini Phone is a gadget which acts as the core of a mobile phone and can work as a standalone device. The interesting thing is that the Modu also acts as a core of other “jackets” which can expand the functionality of the phone to make it in to a gaming phone, smartphone or music phone. Expect to see the Modu later on this year or early next year.